This is the first of two posts detailing how to install and operate the Gadget-2 hydrodynamics code. Click here for the second post in the series. Today’s astrobite will be another in a series on career advice and useful astronomical tools. So far, it looks like there’s been a dearth of posts on the tools of theoretical astrophysics, so I thought I’d take the opporunity to show how easy it is to run a simulation using Gadget-2, a smoothed particle hydrodynamics (or SPH) code. Gadget-2 is open source and publically available, so anyone can run simulations with it. In a future post, I’ll discuss how to set up and run a simple hydrodynamics test problem. The instructions for installing Gadget-2 will be highly platform dependent. If you’re running Linux or UNIX, you have all of the tools you will need to compile the codes already. If you’re on a Mac, you’ll need to install and update Xcode, which includes all of the compilers you will need. On Windows, you’ll probably need to install cygwin which will give your Windows installation full UNIX support. 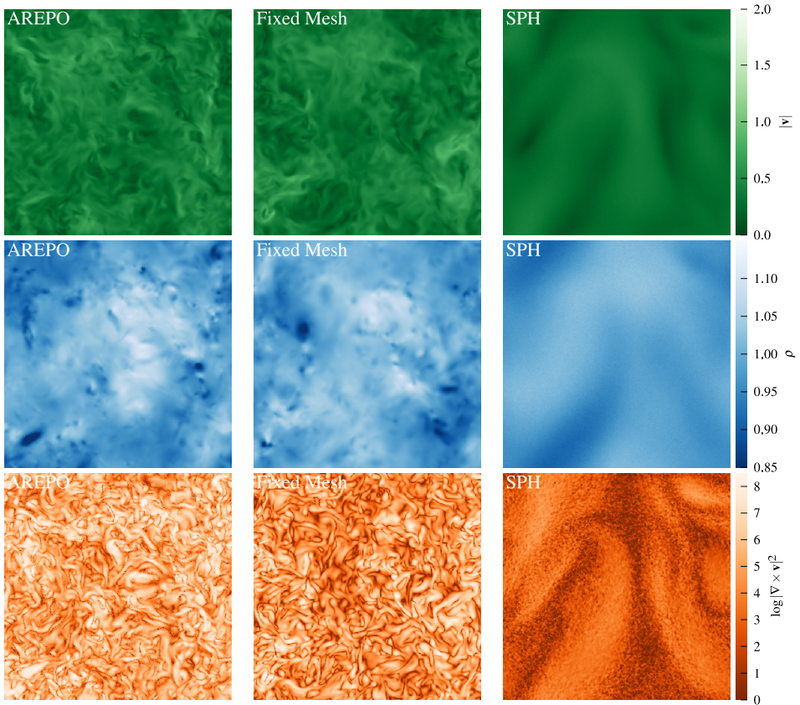 A simulation of cosmic structure formation run with Gadget-2 (Springel et al. 2005). Since I have a Mac, I’m going to focus on getting these codes working on OS X Snow Leopard. If you have a different system, it might not be possible to follow my instructions exactly. I’ll be doing all of the simulations for this series of posts on my laptop, a Macbook Pro. First, you will need to download a few software packages. Version 1.9 of the GNU scientific library (GSL). Version 2.1.5 of the FFTW fast Fourier transform library. Open-MPI is included with OS X so if you have a Mac, do not install an MPI library. Don’t download version 3.x of the FFTW library since it doesn’t include multiprocessor support. I’ve gone with the default option of installing GSL to root system directories. If you don’t have administrator privileges, you can install the software to your user directory by adding “–prefix=/folder/to/install/to” to the configure line. Leave out the quotes and change to your choice of folders when you do this for real. The most important change is commenting out the HAVE_HDF5 line to avoid a compilation error. # additional target platforms, and to get things properly compiled. You can define your own SYSTYPE and tell Gadget where you’ve installed GSL and FFTW. By default, they’re in /usr/local/. The MPI library that comes with OS X is in /usr/lib/. Now you’re almost done! Just save the changes you’ve made, exit out of your editor and run “make” in the Gadget-2 code directory. That should produce an executable called Gadget2 that you can run simulations with. Next time, we’ll setup and run a simple hydrodynamics test. Stay tuned! I recommend using –prefix=$HOME/opt or something like that,, which doesnt require root permission. Also, I’ve learned through many experiments that having a specific version in /usr/local can kill other programs that depend on another version of that library or package. One approach I’ve taken is a method which allows you to maintain several versions of compilers/python/packages/.. per shell, but on demand. This post is great, please make more of this type. I’m definitely going to try and run a simulation. Please also show some ways of analyzing the simulations beyond the nice video (which I’m also not sure how to make). While ceating the exectuable ./Gadget2 by “make”, I get the following error. Can anyone please help me to fix it? You need to install both precisions of fftw. I have this same problem, running on OS X Lion. For some reason Lion does not come stock with mpi installed, so I had to install open mpi. Now I can’t get past this compile-time error about the fftw library. When you run the make commands in the comment above, you are referring to the GSL’s Makefile, right? Okay i understand the generated makefiles now, but I think there are certain arguments i need to apply in the fftw configure command to generate the right makefiles for my OS environment… has anyone overcome this issue? Thanks, your help is greatly appreciated! Does anyone know why is that ? Are you sure that there is a galaxy directory? Yes I am sure. I made a Galaxy directory in which I copied the executable and the galaxy.param file. Hmm, I’m really not sure. Perhaps the problem is that you are referencing your home directory using the ‘~’ shortcut. Try to use the absolute path (e.g. /home/Documents/…) instead. Are you sure that you have permissions to write to the galaxy directory? I have done what ever you suggest in above but after i finished the step 3 then i go to directory where i have extracted Gadget-2.0.7 and try to open it it shows message like this “The folder contents could not be displayed. You do not have the permissions necessary to view the contents of “Gadget-2.0.7”.so what to do please help me. I’m nearly done installing Gadget2.0.7 on Ubuntu (11.10) if you’re still interested. hi i am trying to install gadget2 on Ubuntu.I am successful in installing and running the simulations but i have a problem on visualizing the output of it.I have used “paraview” software to visualize it but the output is not clear. could you please help me which software do i have to use to visualize the output of gadget2. It looks like you either need to install an MPI library or make sure that the MPI object files are in your LD_LIBRARY_PATH. I’d give you more instructions on how to install openmpi but I need more details on your system setup. The question is: I need to specify a path in HDF5INCL = ? Very very thanks for your help!! **Nathan in the other hand, you will go to Astroinformatics 2012 next July in UCSD? You may want to install hdf5 in the future and recompile gadget with hdf5 support. Hdf5 is much nicer and easier to use than the flat binary format Gadget supports by default. I will not be at UCSD in July although I know several people who will be there. i am also the student of astrophysics and doing my master thesis on large structure formation using GADGET2 software. In which topics are you doing thesis. This is Gadget, version `2.0′. Allocated 25 MByte communication buffer per processor. already exists? Gadget will not create it for you. you have mistaken O with zero. thanks for your good and useful comments. I installed SPLASH but encountered with this message. Would you help me fix it? The galaxy merger test doesn’t include SPH particles so SPLASH does not recognize the output files as being from an SPH simulation. SPLASH doesn’t read gadget star particles. You’ll need to write your own analysis scripts if you want to take a look at the snapshots. how can we visualize the output of the gadget2 files. I have used “Paraview” software but the output is not clear. do you know how can I install HDF5 for linux (ubuntu)? The instructions in this post should work on ubuntu. You should also be able to say sudo apt-get install hdf5. You’ll need to link against the version of hdf5 that apt installs so you’ll have to modify your gadget makefile accordingly. I’ve installed Openmpi with no problems (On Lion btw). The MPI compiler wrappers aren’t in your search path. Where did you install openmpi? Is that folder in your $PATH? Note: This is a massively parallel code, but you are running with 1 processor only. Compared to an equivalent serial code, there is some unnecessary overhead. Code was compiled with periodic boundary conditions switched on. You must set `PeriodicBoundariesOn=1′, or recompile the code. After this, I changed the command to “-np 1” and changed the `PeriodicBoundariesOn=1′ in galaxy.param file. But in that case I didn’t get any snapshot file. Cannot understand what is wrong. The sph particle simulation ran well, but can’t figure out what is wrong with this one. My best guess is that your mpi library isn’t configured correctly. It looks like mpirun is running two instances of gadget rather than one instance running on two processors. Just had this exact same problem. Then make it again, and go through the same steps. I was wondering if you could help me? I’m a Master student in the UK needed to do some galaxy simulation. I am running through the steps of installing Gadget2 on my Macbook Pro running Mountain Lion, however I have run into a few problems. I’ve listed them here, any help you can give me would be brilliant and thank you for your time in advance. Ok, so I have downloaded all the relevant modules and software packages you talk about. I’ve extracted the software into a dedicated folder and I have successfully installed GSL without any problems. F77 Object File Type produced by “gfortran -O2” is : : Mach-O object i386. My compilers come from the newest version of Xcode (4.5.1) downloaded from the Mac App store and I have installed the command line tools from within Xcode. I was wondering what you think I should do or if know yourself how to get around this? I am pretty novice with all of this stuff so any help (however basic) is much appreciated. Hi Jono: you need a fortran compiler. Apple in their infinite wisdom do not bundle gfortran with Xcode. Take a look at the R for Mac OSX site at AT&T research. where can we find governing equation in Gadget2 and how can we change this equations? I’m on Lion, as Matt was. How can I add the MPI wrappers to the search path manually? Thanks. Hi Brendan. Sorry I can’t be of much help, I’ve never done this on Lion. You need to make sure that the mpi compiler wrappers are in your search path. Compare your $PATH environment variable with the location of the compiler wrappers. I then installed fftw with correct flags and it seemed to work. Would it be a double precision thing with fftw? You’re trying to link against a library that lives in a directory which doesn’t appear to exist (/usr/common/pdsoft/lib). Check you gadget makefile and make sure that it’s using a SYSTYPE appropriate for your computer. Hi, I’ve just running gadeget2 into a amd a8 4processors but it takes to long. How much does it take for the example galaxy.param on your laptop?? Can u tell me, where can we find governing equation in Gadget2 and how can we change these equations? Thank you so much for this brilliant post. The reason gadget crashed is because it couldn’t open the file ‘./Desktop/Gadget-2.0.7/galaxy/cpu.txt’. This isn’t a file you have to create, instead it’s a file gadget uses to output cpu usage statistics. If I had to hazard a guess about what’s going wrong, it would be that the directory ‘./Desktop/Gadget-2.0.7/galaxy’ doesn’t exist. Gadget assumes that you’ve already properly setup the output directory you specify and won’t print a particularly helpful error message if someone goes wrong. If you still can’t figure out what’s going wrong, it would help if you paste your galaxy.param file somewhere i can see (like pastebin.com) and describe where you put the Gadget2 executable. Please make sure you’ve followed my instructions in the post exactly. ffmpeg is a little bit limited in that the movie frames need to have uniform filenames and no gaps are allowed in the frame sequence, so if there isn’t a movie_frame_0123, the movie will stop at movie_frame_0122, even if there are additional frames after movie_frame_0123. First, I am so sorry for replying late. I just checked your reply. And, I would like to thank you again. I re-followed your instruction and I could run Gadget-2 successfully. The problem was my PATH. I tried /Users/kimjinsu/Documents/……… instead of /Documents/….. It is really fantastic I can now actually run the Gadget-2 !! I will try ffmpeg soon. Thank you so so so much ! I tried ffmpeg -i splash_%04d.png -sameq movie.mp4. I will look forward to getting your reply. hello nathan this is a great post. I generated the snapshot files in galaxy directory and installed splash to view the snapshot files but encountered following problem. Can you tell me how to produce the images that you have in the website from the snapshots? I don’t think SPLASH can render the star particle only galaxy dataset that comes with Gadget. I used the IDL scripts that come with the Gadget distribution to make the movie at the end of the post. SPLASH will be able to visualize datasets that include SPH particles, as in the next post in the series. You probably need to see a softening length at the command line. e.g. Though I have not done this example, it has allowed me to read dark matter only Gadget snapshots. I’ve been running galaxy simulations in GADGET2 using almost all of the defaults in the provided galaxy.Makefile.and galaxy.param file and i am sucessfull in running it according to above instruction. Can we change any parameters for simulation (like Omega 0, OmegaLamda and OmegaBaryon).if so could you please suggest me the parameters that can be changed by me in simulating galaxy collision test. Can this simulation run in the standard single computer or laptop? If can, is it will be slowed due to only one computer? Thanks a lot for the installation guide. I need another guide: “how to write Initial condition files”. Only a readme file is given in there, no user guide. if u have any info about writing initial condition files, please share. Could you explain why my makefile is looking in the wrong place or how to get it to look in the correct location? Thanks. That error means your C compiler cannot find the “hdf5.h” header, which is provided by the hdf5 library. Do you have HDF5 installed in /usr/local/hdf5-1.6.10, as you have indicated in your makefile snippet? You also do not need to compile gadget with hdf5 support. To turn it off, comment out “HAVE_HDF5” in the makefile, as I mention in the post. So for the time being i have foregone using HDF5. 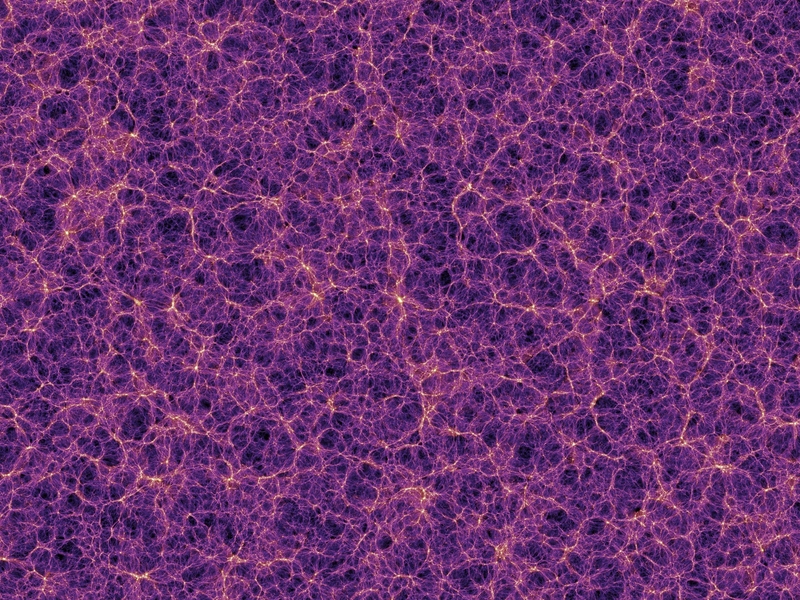 i installed fftw in my home directory instead and now i have colliding galaxies! thanks for the help Nathan. Ill comment back if i ever figure out why /usr/local wasn’t a good location. Thanks for the posts. I’ve managed to get everything working. I am more interested in modelling a box of gas without gas to equilibrium then “turning on” gravity and watch the system (< Jean's length) evolve to a black hole. Can you give some pointers for this set up? I mean > Jean’s length! 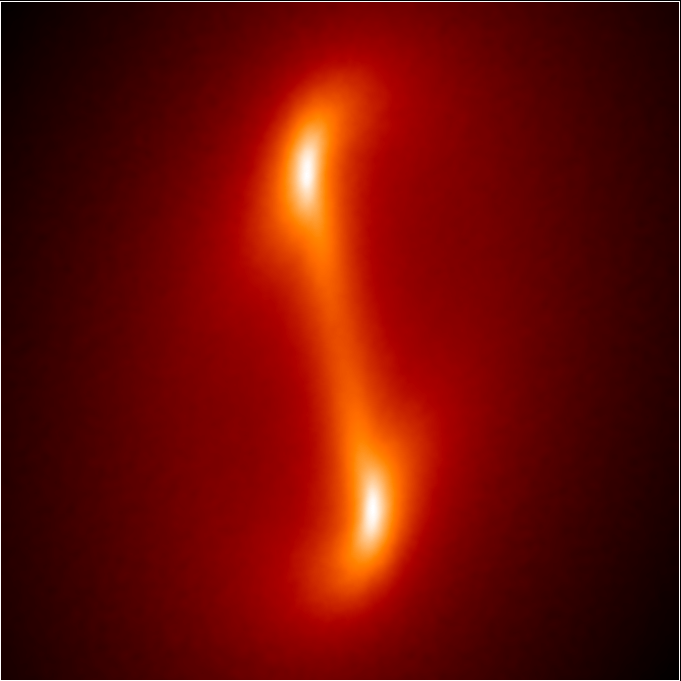 Hi Sean, I am just starting to look at simulating the condensation of the primordial gas into the population III stars and black holes (I suspect more black holes were produced than stars going on how many quasars there are/were). Looks like you are a few steps ahead of me. How did your simulations go? I was able to generate snapshots after running galaxy code. Now I want to convert those .png files to a movie clip. Whats the easiest way to do that? I’m using ubuntu 14.04. Thanks. I tried to find out what this “DSO” means exactly(this abbreviation stands for dynamic shared object files). Any one here has any idea? I have Gadget2 up and running and I have tried to run the Galaxy collision model, but I have found a small problem. Somw of the parameters in the galaxy.param file have the value 0 (zero) at them. (Namely, many of the cosmological parameters). When I try to run the code, as it is, it stalls at the first memory information. I have tried to fill out the values and although the model runs, I am not sure it is the correct values I have given it. What cosmological parameters do you use in the model, including the boxsize? can u pls help me in running gadget 2.0.7 on windows 10.pls i need it badly ,nathan. make and sudo commands not found- error in cygwin . how to resolve ?